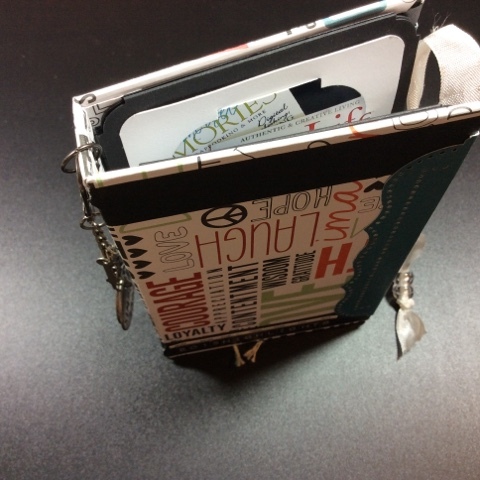 Day 15, For today's page I used another CD envelope, decorated the front and the back and added an insert. On the insert I put a photo of Liberty that we'd taken @ my company's Christmas party, it is a cute photo and shows a close up of her adorable face, definitely something worth remembering. On the front side of the envelope, I was able to use another of my digital products (the negative strip) along with a couple of Christmas products that I purchased specifically for this project (the circle journaling spot & the green tag). One the back side of the envelope, I used some off-hand products. Then in the journaling spot, I made myself a note of what else I needed to get, in order to get all of my gift wrapping done. I find it interesting to know where I was at during that time of the month; the 15th day - I've got 10 days to Christmas and I still had things to wrap. * NOTE TO SELF: have everything done by Thanksgiving - yeah right - but wouldn't that be totally cool! As for the 3rd page of this day, I'm not sure why I didn't take a photo of it, it's a cute page, oh well. There is more coming for tomorrow, hope you all have had a great weekend.